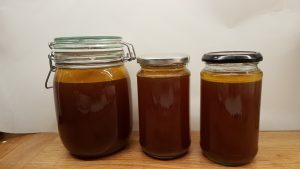 So here at last is my bone broth recipe for you to try yourselves at home. 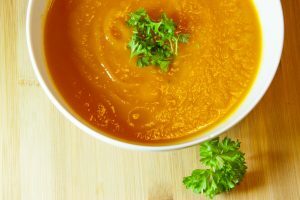 Bone Broth has been all the rage over the last few years with the popularity of the paleo and keto diets and probably many others. But it’s actually an old tradition that has been going for thousands of years across many cultures. It is now often used in cuisines in high end restaurants to create a depth of flavour to soups, stews and sauces. For thousands of years bone broth has been prescribed as medicine to improve digestive health and a remedy for colds and asthma. I use it to provide a high nutrient and mineral diet to my kids. Due to their coeliac disease they naturally don’t take in as many minerals and vitamins, so it’s important to keep them tip top. Bone broth is rich in calcium, magnesium, phosphorus and other trace minerals. It even contains glucosamine and chondroitin – which can also help arthritis and joint pain. Furthermore, homemade bone broths are often rich in gelatine depending on the type of bones you use (the thicker the bone, the more gelatine). Gelatine helps to support the connective tissue in your body and also helps the fingernails and hair to grow well and strong. And if that is not enough bone broth is also full of amino acids, which are the building blocks that aid in preventing inflammation in your digestive tract and promote the growth of healthy probiotics. In addition, it’s easily digestible by your system and, unlike more complex food sources, its soothing nature promotes gut health as you easily absorb its vitamins and minerals. So as part of my journey to get my kids back to good health, bone broth was an obvious addition to our diet. It’s also very cheap! You gather the bones free or at a minimal cost from your local butcher or leftovers from a roast dinner or meat dish. Add some water, herbs and few veggies, a drop of cider vinegar leave it on the stove or a slow cooker for 12 to 24 hours and then you have enough to last you for a week or so. A word of warning about sourcing bones. Firstly it is important that you use bones from organically-raised, pastured or grass-fed animals. The bones collect the minerals which also have toxins from inappropriately raised and fed animals (antibiotics, gmo seeds, fertilisers etc). So you will need to make sure they are from well kept and well-fed animals. Make sure the meat is free range, organic and / or grass fed and contain no antibiotics. I always buy my meat at a good butcher which only free-range or organic and none of their meat contains antibiotics – we’re lucky that we have a good butcher nearby and also very reasonably priced. If you don;t have a good local butcher, you could get away with organic, free-range meat from a supermarket. I’ve got into a routine with it, and I’m pleased to say it’s one of those things that is incredibly simple to do. I make bone broth pretty much weekly or fortnightly. If any of us are under the weather, I’ll make sure we have it more often particularly in the autumn and winter months. Collect bones as you go as you eat bits of meat, then freeze the bones until you have enough saved. Or why not just ask your butcher for bones? it’s easy, they don’t think your crazy and they usually give them to you for free or a very minimal charge. The thicker the bone the longer cook it, but also the more nourishment it has in it. I tend to go for chicken as I prefer the taste, especially in lighter soups. And then occasionally I’ll add a pork or a large beef bone to add more nutrition to the broth. Lamb I find has a very strong taste and can overpower the food that you add the broth to. Boiling bones – beware of the smell. I use a 4.5 litre crockpot, but you can also boil them up on the stove. Do beware of the smell though, especially when the broth is simmering overnight, it can fill the house with the smell. This is why I use a crockpot and have it near an open window or the utility room with the door shut and the extractor fan on. A crockpot is all in all much less smelly and safer to leave for 12 to 24 hours than a broth simmering on the stove. Once you have gathered your bones and have a pot to cook them in, put any uncooked bones in the oven for 10 mins. This will give the broth a much richer flavour, also you can pick off any scraps of meat off. This step is optional but I do recommend it for the taste factor. Many chefs use bone broth purely for richness and depth of flavour in their recipes. 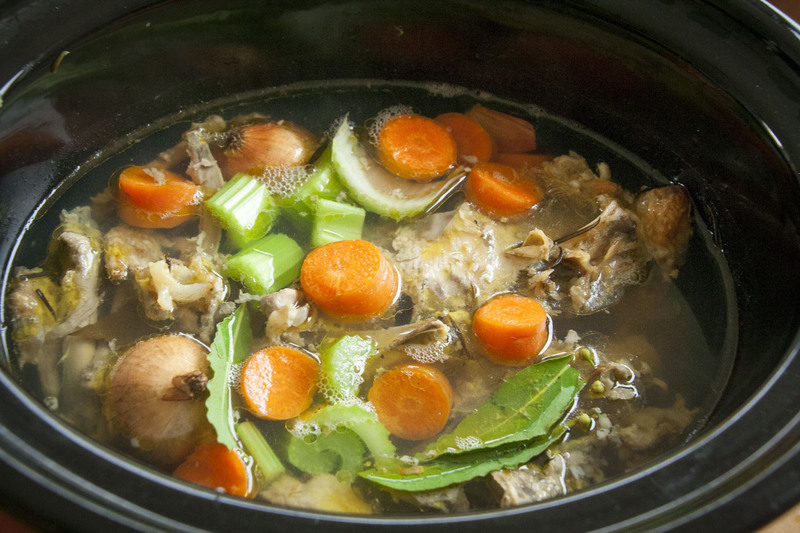 Cover the bones in the crockpot or pot, with filtered water until the bones are just covered. Again optionally you can add some onion, leek, carrot, celery and garlic. You can add herbs too like bay leaf, rosemary and thyme. Then add a tablespoon of cider vinegar and let sit for an hour before turning on the heat. This allows the fibers of bones and cartilage to open slowly. When this occurs, the maximum amount of flavorful juices, gelatine and minerals are released. This is an essential step if you are creating bone broth for the nutritional content. After an hour, you are ready to go. Turn on the heat to low. After a couple of hours or when the water starts to boil, some foam or ‘scum’ may form on the surface. Let the pot simmer on low for 24 hours or until the bones are soft and brittle. I cook chicken carcasses and bones for 8 to 12 hours. If there are large pieces of beef or pork bones you can leave for up to 48 hours. When you have finished, sieve the broth through a sieve into the containers. 1 litre mason jars or large jam jars are perfect. I also pour any that I do not want to use in the next week into smaller containers which I put in the freezer. Frozen bone broth keeps for 3 months. You can pop one or two of the frozen chunks into soups or sauces as you go. 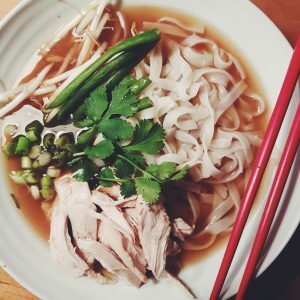 Some of my favourite recipes with Bone Broth is Pho Soup, vegetable soups such as the Three season butternut squash soup , Celeriac and Apple soup, bolognese and casseroles. Good luck with making some, and feel free to ask me any questions in the comments below. To fill a 4.5 litre crockpot. Step 3 Add all bones to the crockpot so they fit nicely without popping up too much. Step 5 Put in the cider vinegar and leave the bones to soak that up for up to an hour. Step 8 After a couple of hours, you can skim the surface of any scum that may appear. Step 9 Leave for a further 10 – 46 hours (depending on the combination of bones). Step 10 Once time is up, leave to cool slightly, then start to strain the broth into jars or containers. Step 11 Put in fridge for up to 1 week, or freezer for up to 3 months. You have inspired me to buy a slow cooker crockpot. 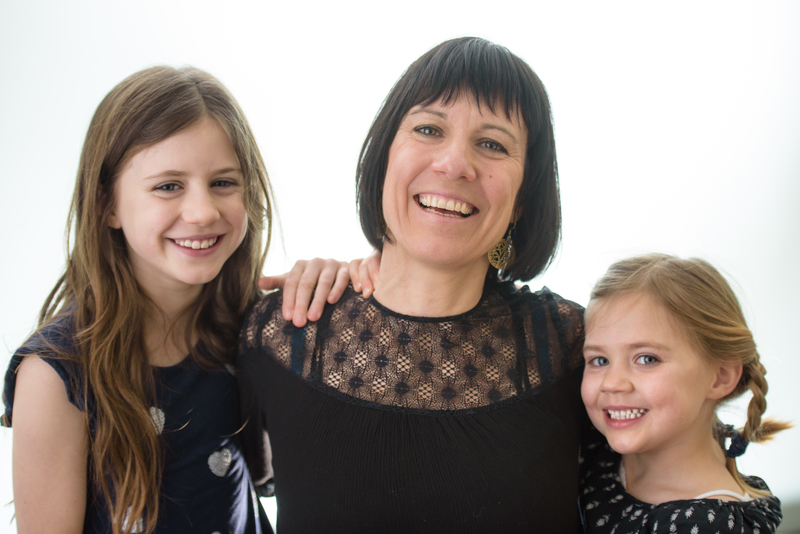 Great idea and thank you for the inspiration, my girlfriend suffers from Celiac’s so this is an amazing blog thank you.